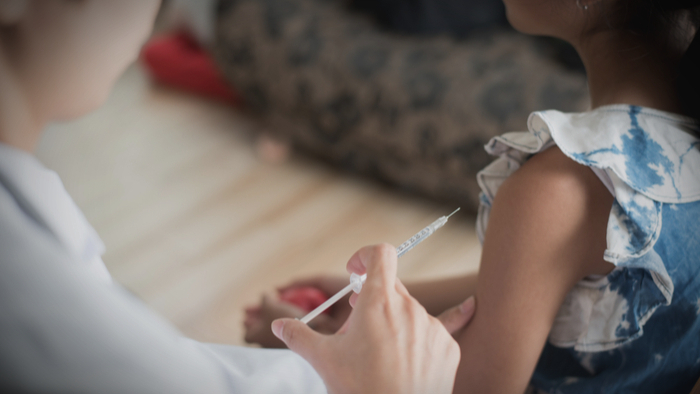 It costs about $2 to fully protect a child against measles and rubella, making the vaccine one of the best buys in global public health. Yet, in low-income countries measles kills more than 110,000 people annually and impacts 20 million more despite the availability of this highly effective, inexpensive vaccine. Here we profile one large-scale effort to eradicate these contagious and deadly diseases. The Measles & Rubella Initiative is a partnership founded in 2001 by the American Red Cross, the United States Centers for Disease Control and Prevention, the United Nations Foundation, UNICEF, and the World Health Organization. It works in close collaboration with governments and other organizations to implement measles elimination and rubella control activities in 77 priority countries. This initiative provides a strong return on investment given the impact achieved for the relatively low cost and resources it requires. Since its inception, the Measles & Rubella Initiative has vaccinated more than 1.1 billion children against measles. The number of measles-related deaths has decreased 79% from 546,800 at the beginning of the century to 114,900 in 2014 with an estimated 17.1 million lives saved and an increase in global measles immunization coverage to 85%, from 72% during this same time period. You can support nonprofits working to train health workers, develop functional health systems, and educate the public. These activities ensure that children in even the most hard-to-reach places receive vaccines. Using their mobile phones, U.S. residents can text PREVENT to 90999 and donate $10 to vaccinate 10 children for measles and rubella. Or donate any amount online. Read the full article about the measles and rubella initiative at the Center for High Impact Philanthropy. How can we achieve Kindergarten Readiness for All Our Children? Diseases and Cures is a fascinating topic, and others found these events, galas, conferences and volunteering opportunities aggregated by Giving Compass to be relevant for individuals with a passion for Diseases and Cures.